Surgical Scalpel or a Craft Knife? A question that is raised time and time again on the social networks, forums and discussion groups is 'Which Is Better - A Scalpel Or A Craft Knife?'. This article sheds some light on the issue for our customers so they can make the correct decision at point of purchase. Usually they will be comparing an X-acto / ACM type knife with its round barrel type handle and thicker blades against the flat surgical type handle with the thinner more flexible surgical blade. There is no right answer as both perform efficiently. However personal preference and the perception of Feel and Control of the Cut should always come into play when making this decision - just like it would for a surgeon. For them it is all about optimising patient outcomes for a crafter or modeller it is all about the quality and finish of the final project whether a birthday card or a World War II Spitfire. The decision should also consider the type of medium you are cutting. Is it paper or dense card? Is it a decal or a plastic sprue? Is it a thin veneer or a piece of mahogany? As a rule of thumb the harder and thicker the medium the more likely that the craft knife will take the day. Then there is the dexterity required to optimise the cutting movement you are making. The craft knives are very efficient for straight lines and also when you need to rotate the handle in your fingers. The flatter surgical handle with its scalpel blade provides greater control when the cuts have some curvature or you are cutting out delicate patterns. 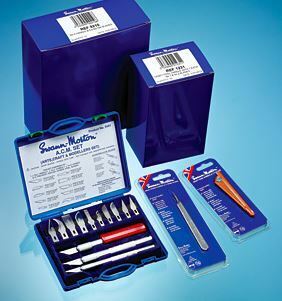 You must remember that the cutting edge on your craft and scalpel blades can easily be damaged if contacting a hard surface so it is advised to use a cutting mat under the medium. Cutting down onto glass, marble or hard wood can reduce the longevity and performance of the blade and there is always the chance you will score the surface underneath. So when making your choice there are lots of different facets to consider however an easier decision is that it should always be a Sheffield made Swann-Morton knife - be it a Scalpel or a Craft Knife.